NY Post: "Madonna and [Husband, Guy] Ritchie had no comment last night as they strolled into their Manhattan apartment holding hands." 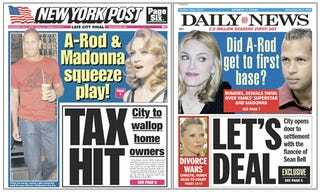 NY Daily News: "Last night, Madonna and Ritchie held hands but said nothing as they returned home from dinner." In recent months, A-Rod has shown active interest in studying the Jewish mystical practice popularized by Madonna, her director hubby, and Demi Moore and Ashton Kutcher, sources said. Rodriguez has visited kabbalah centers in south Florida, where the all-star and the singer both have posh homes, the sources said. The NY Daily News gets double-bonus points for getting a quote from one of the most trusted news sources in all of sports...Jose Canseco. Asked about a Rodriguez-Madonna merger yesterday, Canseco sniped, "That's Alex. That's what he does. He goes after people's wives. I guess he's trying to follow in my footsteps now with Madonna."